"Where quality work is #1"
From data compiled from over 2 million users’ search behaviour and project posts, TrustedPros.ca, a site that helps homeowners find and rate home reno contractors, found that homeowners consistently set unrealistically low budgets for a few of the most popular renovation projects. For instance, the national average budget for a kitchen renovation came in at just under $14,480—at least $5,000 under-budget for the average Canadian kitchen renovation, explains Nicole Silver, spokesperson for TrustedPros. “It takes licensed electrical, plumbing and gas experts to install bare necessities in a kitchen,” explained Silver, “and these experts come at a price.” Add in the extra cost of durable or high-end finishes and budget costs start to creep up quickly. Another renovation project that homeowners tend to underestimate is fence construction. On average, Canadians budgeted just under $4,200 for a new fence, but average actual costs came in closer to $11,700—about $39 per linear foot. Homeowners also underestimated the cost of new floors and new windows, with average household reno budgets coming in at just over $3,250 and just over $8,520, respectively. “The anticipated floor budget is only realistic for very small spaces using low-end materials,” explains Silver. “While the anticipated window replacement budget covers five regular sized windows and no door replacements,” explains Silver, who suggests that homeowners budget about $1,600 per window (more if installing or replacing specialty or large windows). Many homeowners are convinced that they only way to increase the value of their home is to spend a lot of money on high-end finishes and expensive home remodels. But home renovations rarely, if ever, offer a $1 for $1 return. In fact, sometimes the simplest or least expensive updates can give the best returns. For instance, according to Remodel magazine, re-insulating your attic can recoup as much as 117% on the reno dollars you spent, while you can expect a 92% recoup on the cost of replacing your garage door and a 91% recoup on the cost of replacing your front, entry door. Yet, these simple upgrades are not at the top of the reno-desire list, according to the data collected by TrustedPros.ca. 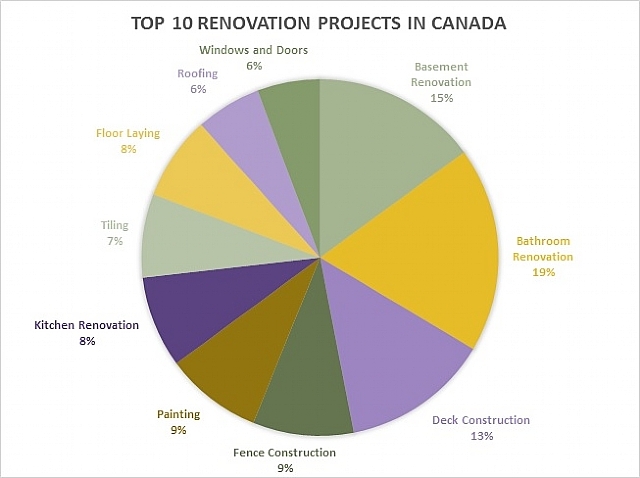 In 2016, the top three reno projects across Canada were: bathroom remodels, basement renovations and the installation of a new deck. To get the most out of your renovation budget, then, you must first be honest: When completing a home renovation, you are spending money, not investing money. With this in mind, consider the reasons why you want to update and remodel and then spend accordingly. Never settle on a contractor before first interviewing and getting a quote. Better still, ask what their contract covers and how they handle ongoing communication and potential problems (remember, surprises can mean extra costs, so you want a clear-cut plan of how this will be handled, before it happens). Nobody renovates their kitchen, never mind their entire home, in just two weeks. Yet, the home shows on TV can leave us with the impression that renovations can be done either quickly or cheaply or both. If you find your the type that likes to compare your house with the glossy mags the home reno reality shows then stop. Turn off the TV and put the magazines away. Now, consider why you want the renovation and what problem it will theoretically fix. Answer these questions and you’ll have a much better idea of what needs to be done and what budget you can afford. Of course, if you’re like Todd Talbot—and use HGTV and home shows as inspiration, rather than as comparison—then watch, take notes and go to it! Are you handy? If so, you could cut some costs by doing the work yourself. But be honest with yourself: Do you have the time or the aptitude? If not, then you’ll need to pay someone to do the work. That means taking all expenses into account—not just labour and materials, but also permits, as well as additional overhead. Remember, the people you hire will make a profit. That’s their job. If that doesn’t sit well with you, consider learning how to do the job yourself. There are always extra costs. That’s because home renovation planning takes a little bit of guess work. How do you know if you have lead pipes or that your oven in a potential fire hazard? To avoid blowing your household budget, due to unexpected reno costs, add a contingency fund. Most contractors suggest adding 10% but larger projects may need a 20% contingency fund. Talk to your contractor for a better understanding of what this extra money could potentially cover. Before a hammer hits a nail you must first decide how you will pay for your home renovation project. Like all consumer spending, paying for a renovation is best done through savings. By saving up the money, you’re more likely to stay on budget because you have more time to research costs and plan the project. This is a loan that’s taken out against the equity you have built up in your home. Under current regulations, a lender will only let you borrow up to 65% of your home’s value. That means on a $500,000 home you could borrow as much as $325,000. So, if you already have a $300,000 mortgage, you could qualify for a $25,000 HELOC. The advantage of a HELOC over a standard loan is that it’s backed by an asset. This collateral allows the lender to offer the loan at a lower interest rate, usually prime plus or minus a percentage. Also, a HELOC allows you to borrow up to the limit, repay and borrow back again, without penalty. Plus, when cash is tight, you only pay interest on the funds you use. Just keep in mind that HELOCs come with additional fees to open and close (called discharging) the loan, fees that can run as high as $1,000. If you’re doing extensive renovations, consider making upgrades with energy efficiency in mind. Upgrades, like insulating the basement or upgrading windows and the home’s furnace, can help you qualify for municipal, provincial and federal rebates that can quickly add up. However, to get access to these rebates, you must first pay for and complete a home-energy audit—a test that will tell you how energy efficient your home is (or isn’t) and then provide a list of upgrades. The audit is done in two parts (before and after) and can cost anywhere from $200 to $1,000, depending on your city, your home and the company you use. Once you’ve completed and paid for these improvements, you can submit receipts and paperwork to various rebate programs. Depending on what you’ve done, you could get as much as $10,000 back, just keep in mind it could take up to a year for the money to come in. If you’re really in a pinch—although you shouldn’t be—you could refinance your mortgage to pay for the renovation. But we don’t love this payment strategy as you run the risk of adding costs to your renovation if interest rates rise. Still, refinancing your home is certainly far more preferable than paying for a home reno using a credit card. Charge cards often come with very high interest rates, meaning you pay an exorbitant premium just to do the renovation. The final tip is, wait for it…be patient. Putting your home reno project on hold gives you more time to save up the money needed for this expensive endeavour. It also means not going into debt for an expenditure that may or may not give you a return on the dollar you spend. Finally, it avoids costly mistakes. That’s because a hasty, under-budgeted renovation can actually devalue your home and add little or no value to your home’s fair market value. And nobody wants to pay for a big blunder.